Many of these pictures were shot in Seneca Falls, NY. Seneca Falls decorates its downtown in fall with scarecrows. Besides beautifying a downtown for residents and visitors alike, such decor themes can be a source for ideas for making scarecrows to use in your own yard. The town is thought to have been the inspiration for Bedford Falls in the Christmas classic, It's a Wonderful Life (1947). While the town is thus most associated with Christmas, its Halloween scarecrows may also leave a lasting impression on you. But let's back up for a moment and begin by discussing just what a scarecrow is. By defining what it is, exactly, that we're talking about, the range of possibilities will widen. The basic scarecrow design hearkens back to pre-industrial agricultural communities in which there was a need literally to "scare crows" away from a garden using simple methods. They hatched the idea of setting up figures in garden plots that at least vaguely resembled human beings. The reasoning was that, if crows thought they spotted a human being in a vegetable patch, they'd stay away out of fear. How well this stratagem actually works is debatable. Motion-activated devices such as the aptly-named "Scarecrow Sprinkler" are a better bet if scaring away pests such as groundhogs is what you're really after. But we're concerned with ornamental scarecrows here. Knowing the origin of the functional scarecrow will help us figure out what qualifies as an ornamental one. Any scarecrow you design should suggest a human figure. So while a black cat is a perfectly acceptable Halloween decoration, it cannot properly qualify as a scarecrow because it draws on the feline form, not the human form. But it's all right to base your design on a witch, a werewolf, or a scary Grim Reaper figure because those are all inspired by human-like forms. Besides suggesting a human form, scarecrows usually (but not always) are decorated in such a way as to make you think of Halloween or the harvest season. These parameters for making scarecrows leave the creator with a great deal of latitude. And folks handy with crafts have taken full advantage of this leeway in recent decades. The variety of scarecrows nowadays is impressive. And yet, in all but the most egregious cases of "pushing the envelope," it's clear that what the decorator is presenting you with is, indeed, a scarecrow. In the classic design, you stuff old clothes with straw to make a scarecrow (which is why it's sometimes called a "straw man"). Allowing a bit of straw to peek out from the bottom of the shirtsleeves or trousers plays up the harvest theme (straw being a farm product). Cloth (or burlap) sacks stuffed with straw, hay, leaves, etc. can serve as long-lasting heads, onto which you can easily draw the features (or sew or glue them on). Pumpkins make for more striking scarecrow heads but don't last as long (unless you use artificial ones). But don't feel that you're limited to the classic design, with its traditional materials. If you're striving for a scary theme, in particular, you may have to think outside the box. The wonderful thing about making scarecrows is that people will admire your work more the more creativity you put into it. The scarecrow head here is a good example of how you can broaden the possibilities for materials to use in such a project. The head is a flower pot. The eyes and mouth are silk flowers, while the nose is a cork. Using black-eyed Susans (Rudbeckia hirta) or sunflowers (Helianthus annuus) for the eyes helps put the viewer in a fall mood, as both are often still in bloom in early autumn; in addition, yellow is a classic fall color. Scarecrows aren't always scary. This one resembles a court jester. Because of what he's leaning against, you can't help but think of those old drunk-on-the-lamp-post ornaments. His loosey-goosey hands give him a devil-may-care look (you can make the hands from raffia or corn husks). This is an example of how scarecrow faces can be made of burlap. Burlap is an alternative to cloth for scarecrow faces. It's a traditional material for scarecrow faces and a fitting one since burlap is associated with gardening (think of the burlap wraps used to protect plants in winter or of the nursery shrubs that have been balled and burlapped for transportation). Burlap is an excellent material for scarecrow faces when you seek a rustic look. The Scarecrow in The Wizard of Oz (1939), who is often used as a model for such figures, sports a burlap face. Here is another use of burlap for the face. But the theme adopted here is a scary one. Werewolves provide an excellent theme for scary Halloween decorations, another example being werewolf pumpkins. A Wolfman scarecrow is easy to make. Focus on the head: The rest of the body, the clothing, etc. are really secondary. If you get the hairline right and provide creepy eyes, you're most of the way there. While not as earthy as burlap, cloth is another material traditionally used to make scarecrow faces. An advantage in using cloth is that it is easy to draw on. Black magic marker works well for making facial features. A jack-o'-lantern is, of course, another option when making a scarecrow face (head). For an alternative to natural pumpkins (carved pumpkins rot quickly), try a Halloween jack-o'-lantern made from a hard-shell gourd! Note the red scarf used for this garden scarecrow: Wrapping a scarf around his neck is an easy way to work some color and style into the ensemble. This one wears gloves, which is a smart idea if you're not satisfied with how the hands come out (just cover them up with the gloves). In terms of support, this garden scarecrow sits on a bench. Having your figure sit down eliminates the extra step of building support for your scarecrow; and since he's not tied to a pole, it also makes him more transportable, should you decide to change his location mid-way through the Halloween decorating season. Since scarecrows are creatures of the garden by nature, it's always good to see a scarecrow surrounded by hardy mums (Chrysanthemum) and the fruits of the harvest, as here. If you don't like any of the traditional ideas for making scarecrow heads (burlap, cloth, pumpkin), again, you can use a flower pot. This is a good use for those leftover plastic pots you have been accumulating in the shed. Pick out a good-sized one and recycle it for use as a scarecrow head. Facial features can be hot-glued onto the plastic, such as flowers for the eyes. If you don't like any of the ideas offered so far, you can always make a pumpkin head out of wood for your Halloween scarecrow. In fact, some people opt for a scarecrow whose entire body is a painted cut-out. This Halloween scarecrow bears a metal head. Recycled plastic pots for scarecrow heads are fine, but many would prefer the earthier "feel" of metal. Plastic is a modern material; metal has been around a lot longer. And we like scarecrows that hearken back to earlier times. A garden scarecrow supported on a wooden frame and allowed to hang loosely makes for a no-nonsense, stable Halloween decoration. Drive a support pole into the ground and screw the wooden framework right into the pole. Don't bother stuffing the figure with straw to fill it out. When Halloween decorating season is over, unscrew the garden scarecrow from the pole, take it inside, and store it away for next Halloween. By not stuffing the scarecrow, you'll have none of the mess associated with a traditional garden scarecrow. There will be no straw to become dislodged and make a mess. But the drawback to a wooden scarecrow is precisely that, without straw (or a similar material for stuffing, such as the leaves you rake up in fall), you have a garden scarecrow divorced from its agricultural roots. This scarecrow is basically a bundle of corn stalks that has been "dressed up." Its maker affixed a cloth head and cloth scarecrow hat to a cornstalk "body." The see-through, orange material covers the mid-section as if it were a shawl or poncho, effectively suggesting a division between a presumed torso and presumed legs. Stiff wires sticking out on either side of the support pole provide "arms" over which the orange fabric can be draped. This Halloween decoration is a well-made scarecrow that makes use of a prop (the bike) very successfully to draw attention to itself. The Scarecrow in The Wizard of Oz, who yearned so for a brain at the beginning of the movie, would be proud to know that one of his compatriots has learned how to ride a bike. Not surprisingly, Wizard of Oz Halloween themes are popular, given the fact that both a scarecrow and a witch play prominent parts in the movie. Straw is the classic material for scarecrow hats. If you wish to evoke a traditional mood in making your scarecrow, you can't go wrong using a straw hat. To make the face for this figure, eye, nose, and mouth shapes were cut out of felt and glued on (again, very conventional). What's not conventional about this display is the means of support provided for the scarecrow: a bicycle. Witches usually appear in hats, so, witch scarecrows, too normally wear hats. But the red wig on this witch scarecrow provides a nice change of pace from the usual pointy hat. Red is a good choice for color when choosing a witch scarecrow wig because it shows up well from a distance; blonde hair would also work well, for the same reason. This, despite the fact that witches are usually portrayed as having black or brown hair. Rather than being purely decorative, a scarecrow can also serve a useful purpose, as here. No, it's not to scare crows. 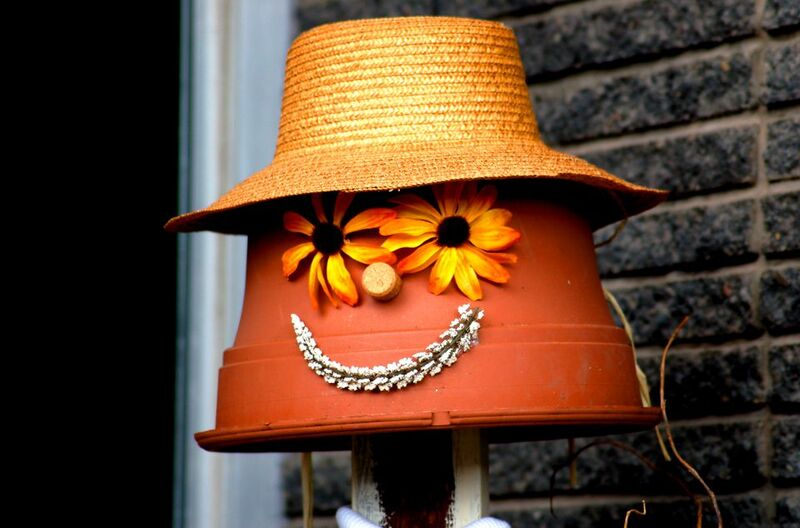 Rather, this scarecrow functions as a planter. It has a plastic pot for a head. The head has been put to good use, in this case. This family wears classic scarecrow garb. The husband wears a checked shirt and jeans. The wife sports the kind of flowered dress that you'd expect a farmer's wife to wear. Finally, you can't go wrong with overalls on a scarecrow, and that's precisely how the child scarecrow is outfitted. All have straw hands. Here's another option for positioning your garden scarecrows. Garden scarecrows often merely stand around; the lazier scarecrows even sit down on benches. But with a few simple props, you can put your garden scarecrows to work, injecting action into the scene. And considering that scarecrows are fall decorations, a natural activity to portray them as performing is raking leaves. Simply put them in a spot in your landscaping where leaves have fallen, stick leaf rakes in their hands, and, voila: You have a scarecrow crew raking leaves off your lawn. The wheelbarrow here is optional but nicely reinforces the idea. Here's another great excuse for incorporating gloves into your decoration. In a work scene such as this one, gloved scarecrows are in keeping with the theme you're trying to convey. Not all "props" in scarecrow displays are manufactured items such as rakes and bikes. The straw bale is the "prop" in this scarecrow display. Hay bales or straw bales make wonderful seats for scarecrows since they evoke country living and farming. It's easy to create an idyllic scarecrow display. Simply surround a traditional scarecrow with straw bales, cornstalks, a large pumpkin, and fall flowers. Your scarecrow display will be the talk of the neighborhood.